A delightful 6¾ mile circular walk from Cubbington over open fields - enjoy the historic village of Offchurch, and brief sighting of the River Leam. The start of the walk follows a section of the MILLENNIUM WAY clearly waymarked with the distinctive Millennium Way circular waymarkers. Find out more about the walk by clicking on the information icon. For the start of the walk, you will enjoy the delights of The Millennium Way on the outskirts of Leamington Spa before returning to Cubbington via Offchurch. 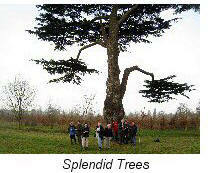 The walk is around 6¾ miles across mostly flat open countryside. We start our walk from The King's Head pub in Cubbington. You will find the pub opposite St. Mary's Church in Church Hill. Facing the Kings Head pub, go downhill to the junction with Church Lane then cross ahead into High Street, with Old Manor House on your left. Follow High Street into village centre, where it becomes Queen Street. Continue ahead past shops and The Queen's Head pub to the junction with Windmill Hill. Turn left here into Offchurch Road walking past houses on your left and in 160m cross road to find kissing gate in hedge. Here you will see the distinctive black Millennium Way waymarker. Take kissing gate and go gently uphill on a well trodden path with hedge right. A tower block soon comes into view. The path levels off then continues gently downhill to corner of field where you should take the narrow hedge gap on your right to enter the next field where you will turn immediately left and cross field to pick up concrete track ahead. Continue uphill past house on left and converted barns right to go through kissing gate to right of track by cottage, keeping ahead. Go along right edge of field with fence right to take next kissing gate at bottom right of field .Turn immediately left to follow with hedge left gently uphill, keeping tower block on your far right. After some 300m you will arrive at a wide gap on your left with solitary waypost ( uprooted but nestled in a tree branch. ) Take gap, then go with hedge right following path around field edge to arrive at wood on your right. At far corner of wood (The Runghills) turn sharp right through narrow gap over sleeper bridge which crosses ditch, then immediately under power lines continue ahead to the corner of the wood to take gap right to go ahead with wood right and exit by corner gap. Continue ahead to find and take sleeper bridge towards Redhouse Farm and then go directly ahead over field to hedge gap. Ignore stile left and take gap and proceed ahead to concrete drive. Go left on drive and after some 30 paces go right with fence left to take kissing gate into field. Go ahead with fence and hedge left and at field corner go right keeping hedge left and watch for hedge gap left with small waypost. Take gap and cross ditch via railway sleeper to enter Newbold Comyn Park. Cross the cinder path and go ahead with hedge right over former golf course to reach wide hedge gap leading to well worn path. Go left on path (at this point you are leaving the Millennium Way) keeping ahead with former golf course on left. At end of track ( ignore where it swings right ) instead keep directly ahead to right of woodland to re-enter former golf course. Keep same line ahead with woodland left to eventually reach cinder path where you will see a wooden bench. Turn left along cinder path and after 100m take hedge gap right over small concrete slab bridge and continue ahead across next field towards hedge gap. At this point go into the right field and keep ahead with hedge left. Take the stile and go right for 100m with hedge right, then half left towards the footbridge over River Leam. Cross over the footbridge, then go right along woodland footpath, with river right, to cross over bridge and take stile ( with no footplate ) next to metal gate ahead. After 20 paces go right along grassy track and keep left at corner ahead following around grassy track with hedge right. Cross over surfaced track ahead and continue on the same line keeping small ditch on your right. As you reach the corner where the ditch ends, turn right by the brick wall and wooden fencing to walk along the surfaced track. (In the winter you may get a glimpse of St. Gregory's Church in Offchurch, but in summer this will be obscured by the trees in leaf). As you reach the bend ahead, turn left by the yellow waymarker signposted Offchurch. Continue along to the corner of the woodland then go with woodland left to take wide gap and stile ahead into field. Go up field keeping River Leam in the dip to your left. Stay ahead to exit field by far corner stile to road. Turn right on road and pass The Stag Pub on your right. Approx 30m after passing The Stag take the waymarked footpath left between houses and go ahead to take kissing gate and continue directly ahead across the next field. Exit by stile and continue between farm buildings (Manor Farm) to take large metal gate through farm buildings and stile next to metal gate to next field. Stay ahead with fence left to take two further stiles by metal gates and go up next field keeping hedge left. At the field corner go directly ahead to take metal kissing gate which will take you along a winding path through the short section of woodland, soon to emerge to take metal gate into the next field. Go ahead with hedge right to reach farm buildings at field corner. Turn half right for 40 paces to go half left down a clearly defined farm track past a small overgrown brick building on your right, when after some distance it eventually swings gently right to a gate. Take waymaked gate into field then half left to take footbridge over River Leam, then ahead through short section of woodland emerging to walk uphill with hedge left. Take the wide gap on your left and follow ( broken ) waymarker into field to take path diagonally half left across field to pass under power lines. Go through gap ahead across sleeper bridge to next field and stay on same heading keeping hedge right. Continue uphill for some while, keeping hedge right and as you near the edge of South Cubbington Wood ignore the footbridge on right and go ahead to skirt around the southern border of the wood. (Do not take any of the tracks which enter the wood). Keep ahead past the wood with hedge right. 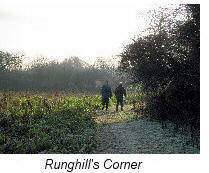 At the corner of field stay ahead down the track between hedges eventually to reach surfaced lane. Turn right on lane (Mill Lane) to descend gently to the main road. 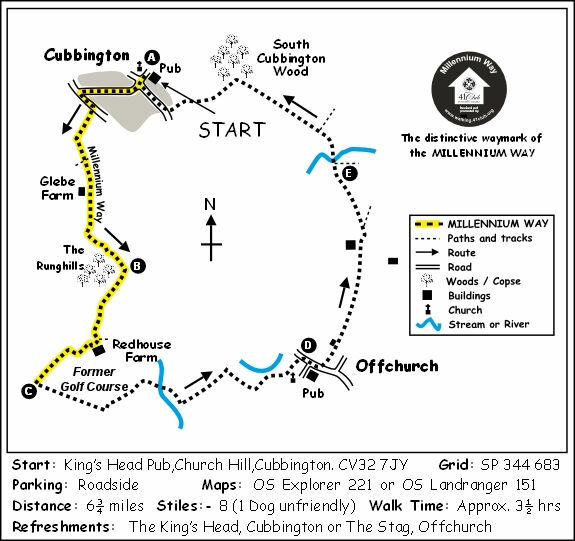 Stay ahead along the main road (New Street) to the crossroads then turn right to reach your starting point at The Kings Head in Cubbington (We enjoyed an excellent lunch at reasonable price). There are two possible origins for the name of Cubbington based on its earlier names. The first is Cobynton, meaning "town of the descendants of Coba". The second is from the name used for a period of time after the Domesday Book of 1086, Cumbynton. Cumbe was a medieval word signifying that a settlement was in a low or deep hollow. The fact that the village lies in a shallow valley supports the second theory. Cubbington church of St Mary dates from early 12th C, the massive tower is late 12th C. It was a chapel for the nearby priory of Leek Wooton. Jane Austen's brother James was vicar of St Mary's between 1792 and 1820, but never visited Cubbington as he lived in Hampshire! Down from the Kings Head public house on the crossroad is the 18th C manor house in red brick with stone quoins. Opposite on the south side of the crossroads is an L shaped 16th C timber framed house in square panels with brick nogging. Until the mid-1820s the population of Cubbington was larger than that of Leamington, which now dwarfs Cubbington. 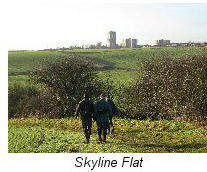 The tall flats are on the Lillington estate. Eden Court is 15 storeys high and consists of 89 flats. After the former golf course, the Offchurch Estate is entered. 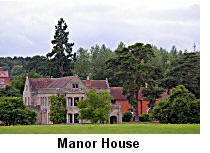 Offchurch Bury is the Manor House, originally a 16th and 19th century building but reduced in size by 75% in 1954. The estate was purchased in 1936 by Harry Johnson, a textile manufacturer from Coventry and Macclesfield, whose descendants today retain much of the estate and live at the manor. The house is not open to the public. The origin of the name "Offa's Church" suggests a connection to Offa, who was King of Mercia from 757 to 796. There is a legend that Offa's son, Fremund, 'a man of great renown', was murdered and 'buried at his Father's Palace, now called Offchurch' the church being built to commemorate his death. 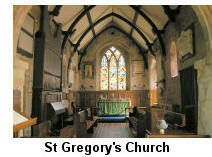 There is no trace of original Offa's church, but St. Gregory’s church, rebuilt from 12th century onwards, on the supposed site contains Norman elements. Another local legend says that if you go to the top of the church and jump off, King Offa will rise from the ground and catch you!